Michael Dunlop on the Bennetts Suzuki. Michael Dunlop will provide the first glimpse of the Bennetts Suzuki GSX-R1000 in action on the roads on Tuesday as the reigning Vauxhall International North West 200 Superbike champion kick-starts his 2017 campaign in earnest. Dunlop made the move to the Japanese manufacturer this year as he opted to remain within Stuart and Steve Hicken’s Hawk Racing squad after a switch from BMW. The 28-year-old from Ballymoney has enjoyed some of the greatest moments of his career on the S1000RR, clinching a double in the Superbike and Senior races last year at the Isle of Man TT, when he became the first rider in history lap the Mountain Course in less than 17 minutes. The 13-time TT winner also set a new outright lap record on the BMW at 133.962mph on his way to victory in the Senior, underscoring his superiority on the German machine. 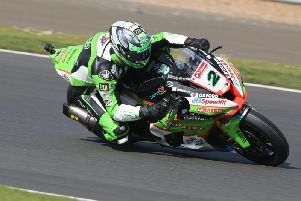 He also clocked a new absolute lap record at the North West 200 last year, bettering Aussie Josh Brookes’ previous benchmark to raise the bar to 123.207mph as he powered clear at the front to win the shortened Superbike race, which was halted when Bruce Anstey crashed out of second place. Three big bike victories at the TT in 2014 in the Superbike, Superstock and Senior races on the back of a win in the feature NW200 Superbike race a few weeks beforehand signalled the beginning of the formidable Dunlop/BMW partnership, but this season he has grasped the nettle as he attempts to turn the new Yoshimura-backed GSX-R into an international race winner. He has given little away so far, but Dunlop – whose new autobiography, Road Racer: It’s In My Blood was launched last month – says he still has a lot more to offer. “I’ve heard people call me the greatest road racer in the world and you just think ‘aye, there’s been plenty of other good lads before me’. But I know that I have achieved a good bit of stuff in my career in the case of a short period of time,” he said. “I’m probably one of the only true real road racers left because a lot of the others have come from the British championship. I’ve done a half decent job but hopefully there’s a bit of life left in the dog yet and I can keep at it. On his new steed for the Superbike and Superstock classes, Dunlop said he had faith the bike would be up to the job. He will also ride a Yamaha R6 in the Supersport class and a Kawasaki for McAdoo Racing in the Supertwin races.